Any self-respecting kid who loves water or the ocean loves Aquaman, and it's not hard to see why: A founding member of the Justice League of America, the dude can breathe underwater, swim at macht speeds, see in near total darkness, and even telepathically communicate with marine life or basically any being that lives upon the sea or is even evolved from marine life. He can even swim up Niagara Falls! This guy's body is basically a walking water park, and he's living every future marine biologist's (or Shark Week affectionado's) dream of being able to rap it out with sea creatures at will. And now, turning your child into the master of the seas starts with this Child Dawn of Justice Aquaman Costume! Complete with the muscles and tattoos seen in Zack Snyder's Batman v Superman film, your kid will look ready to tangle with deadly foes like Doomsday and Lex Luthor. Of course, you might have to teach your kid how to talk to fish if you want him to wield the full extent of the DC superhero's powers, but this officially licensed costume will give him the right look in no time! Made with 100% polyester, this jumpsuit features printed detailing to look like Aquaman, and even comes with a padded chest for a grade-a superhero look! It's got attached polyfoam gauntlets and boot tops (which have an elastic security band under each foot with a Velcro closure), and a chest bandolier sewn right onto the jumpsuit. Both the belt and jumpsuit have Velcro enclosures on the back, making it easy for your child to swiftly shed his superhero costume when you're ready for him to come back to dry land. 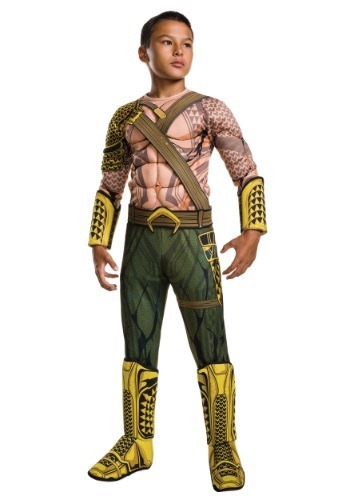 Don't get wet with any other imitations...this officially licensed Deluxe Child Dawn of Justice Aquaman Costume will make all of your kid's aqua-dreams come true!